Sofia Richie Calls Scott Disick "the Male Version of Me"
It is often said that a couple that laughs together, stays together. Well, Sofia Richie jokes that boyfriend Scott Disick is the "male version" of her with regard to their senses of humor. The 19-year-old model and 34-year-old Keeping Up With the Kardashians star have been dating for several months. Their romance is the longest Scott has had since Kourtney Kardashian, with whom he shares three children, broke up with him in July 2015. When asked what makes their relationship special, Sofia told E! News, "I just think he's the male version of me. Our humor. We have very similar humor." Sofia made her comments at the launch of Issey Miyake fragrances L'Eau d'Issey Nectar and L'Eau Majeure d'Issey at Milk Studios in Los Angeles on Thursday. She also talked about the perfume, saying it reminded her of her childhood, and also discussed her hair. The model returned to her brunette roots in December after showcasing blond hair for ages. "My hair grew annoyingly fast," she said. "When it was blonde, it would grow in a week and a half and I'd have to get my roots done, and for like four and a half years, I did my roots once a week. I was spending a fortune for four years. So I got over it, and this is my natural color. This isn't my natural length, even though I wish. I'm just glad that I don't have to touch my hair, and my hair isn't gonna fry anymore." Scott did not accompany Sofia to the event, which she attended with friends. However, they two are often spotted out and about together in Los Angeles and have also traveled abroad together. 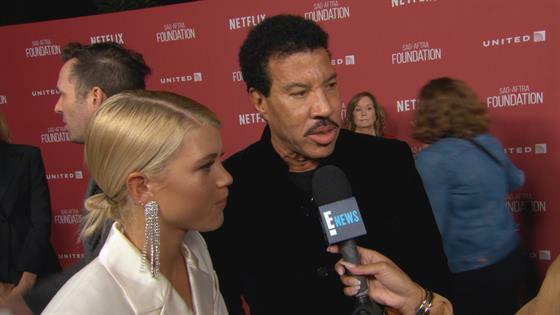 Sofia's famous dad, singer Lionel Richie, has occasionally weighed in with his thoughts on her relationship with Scott. He has not appeared to be that enthusiastic about it, but he is not intervening. "She's 19," the singer said in an interview with an Australian outlet last week. "When you're 19 you know everything. Is it going to be for life? I don't know. But for right now it's just a phase and I'm going to stand real still in the corner, get me a good drink and not make too much noise." Watch Keeping Up With the Kardashians on Sundays at 9/8c on E! Nikki Bella Clarifies Her and Artem Chigvintsev's Relationship Status: TMI Alert!